Open Cell Foam can solve both thermal and sound insulation problems in commercial and domestic situations. Why not contact us today to arrange a site visit 01565 873871. Here at Green Insulation we can advise on the appropriate application for your building. 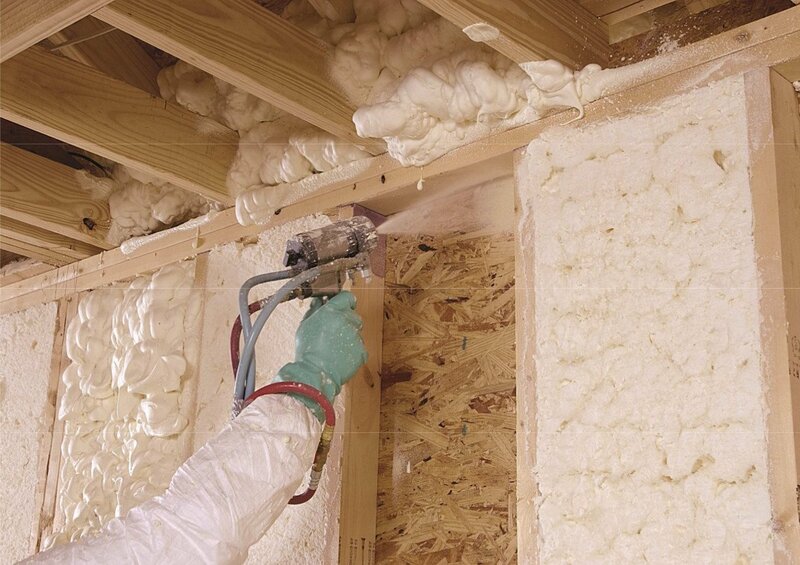 Open cell spray foam insulation provides a cost effective fully breathable insulation solution. Green Insulation UK use open cell foam materials that are manufactured here in the UK. Our open cell spray foam will seal and insulate and provide an airtight building envelope. It will reduce heat loss and it will produce a comfortable and healthier environment within your premises. Because of its open cell structure it also acts as a very good sound insulant keeping out unwanted noise from outside the building. Considerable cost savings can be made on heating or cooling costs, you can expect to save up to 50% on energy bills when a building is suitably insulated and air sealed. The foam keeps conditioned air inside and unconditioned air out. During the application process the material goes from a liquid state and expands by over 100 times its original volume. It seals all joints and cracks to form a seamless airtight layer. Fast application with little waste, minimum fuss and maximum effect. I would like to receive further information from Green Insulation UK By using this form you agree with the storage and handling of your data by this website. Many older commercial buildings are constructed from corrugated cement asbestos sheets or profiled metal sheets. To fix insulation board to the underside of these sheets is difficult and almost always means that there is a gap above the insulation board. This means that vapour can pass through the joints in the boards and condense on the cold roof sheets, causing the condensation to flow down the corrugations, find a week point and, consequently, drip into the building. Spray foam insulation on the other hand is sprayed directly on to the profiled sheeting leaving no gaps or joints, it seamlessly insulates and therefore, surface condensation will not form. Spray insulation will also seal the building so that any air that is generated within the building whether it is cooled or heated is kept within the building and does not escape into the atmosphere. This obviously improves the carbon footprint and saves money spent on energy. Another advantage over traditional insulation materials is that joints, small holes and small cracks are sealed and thus prevent leaking. Single skin asbestos cement sheet and metal roofs are subject to significant heat loss in the winter and solar gain in the summer. Un-insulated roofs of these types are likely to form condensation on the underside, which can cause major problems for items stored in the building. It can also cause problems with slip hazards or dripping on to electrical appliances. Spray foam insulation will eradicate the formation of condensation and create a dry, warm workspace. Spray insulation seals the building so that any air that is generated within it, whether cooled or heated, is kept within the building and does not escape into the atmosphere. This improves your carbon footprint and saves money that would normally be spent on energy. This also means that joints, small holes and small cracks are sealed and, thus, prevent leaking. Where asbestos is present, our spray foam will seal and encapsulate the roof sheets and, therefore, prevent the escape of fibres into the working environment. Where the roof is leaking badly or the logistics of spraying internally are too difficult we can apply the foam externally. This will seal all the joints and cracks and give a monolithic, seamless flashing to the roof. Once the foam has been sprayed then a spray/ brush applied elastomeric or acrylic coating is applied to the foam surface to protect it from UV degradation.